Families and carers of people with dementia may be faced at some time with the problem of what to do if the person begins to wander. Wandering is quite common amongst people with dementia and can be very worrying for those concerned for their safety and well-being. The person’s failing memory and declining ability to communicate may make it impossible for them to remember or explain the reason they wandered. A person with dementia may feel uncertain and disoriented in a new environment such as a new house or day care centre. Wandering may stop once they become used to the change. The person may also want to escape from a noisy or busy environment. Wandering may be due to a loss of short-term memory. A person may set off to go to the shop or a friend’s house, and then forget where they were going or why. Or they forget that their partner has told them that they were going out for a while and set off in search of them. As people become more confused, they may wander off in search of someone, or something, relating to their past. This may be a partner who has died, a lost friend or a house they lived in as a child. As dementia progresses people find it harder and harder to concentrate for any length of time. Wandering may be their way of keeping occupied. People with dementia may suffer from insomnia, or wake in the early hours and become disoriented. They may think it is daytime and decide to go for a walk. Poor eyesight or hearing loss may mean shadows or night sounds become confusing and distressing. Changes that have occurred in the brain may cause a feeling of restlessness and anxiety. Agitation can cause some people to pace up and down or to wander off with no apparent purpose. They may fail to recognise their own home and insist on leaving. Sometimes people leave the house because they believe they have a job to do, or are confused about the time of day, or the season. This may be related to a former role such as going to work in the morning or being home for the children in the afternoon. The precautions you take will depend on the personality of the person with dementia, as well as how well they are able to cope, their reasons for wandering and whether they live in a potentially dangerous or in a safe and secure environment. Speak to your doctor - A physical check-up will help identify whether illness, pain or discomfort has triggered the wandering. Discuss the side effects of medication with the doctor. Try to avoid medication which may increase confusion and cause drowsiness and possibly incontinence. Ensure the person is identifiable - It is important to ensure that the person carries some form of identification in case they do get lost (this is especially important on holidays). An identity bracelet with name, address and telephone number can be very helpful when a person is missing or found. Another option is wearing a Medic Alert bracelet that gives a telephone number. Similarly it may be helpful to sew a nametag into every garment the person wears regularly. In some areas services are available where a person’s photo and profile is electronically recorded and easily accessed to alert authorities should the person be missing. 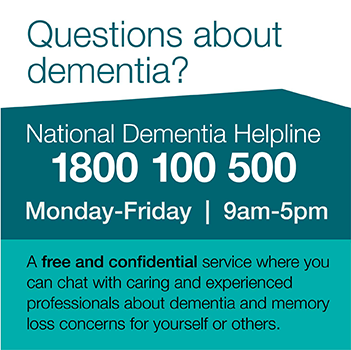 Dementia Australia has Identification Cards available. Identify any wandering pattern - Some people find it helpful to keep a record or diary so that they can see if there is a pattern to the wandering behaviour. It may occur at certain times of the day or in response to certain situations which can then be more carefully controlled. Remove key triggers - Try to reduce the number of objects in sight which may act as a reminder to the person to wander. Handbags, coats, mail for posting and work clothing may encourage a person with dementia to wander. Involve neighbours and local business owners - It often makes sense to tell neighbours and local shopkeepers about the problem. Most people are very helpful once they understand the situation and may offer to keep a friendly eye on the person. Make it more difficult to wander - Sometimes it is sufficient simply to relocate door locks where the person will not think to look for them. Otherwise you may want to consider bells and buzzers which sound when external doors are opened. Give them a safe place to walk - Make part of the garden secure so that it becomes a safe place to walk around. Make a thorough search of the house and out buildings. Write down what the person was wearing. Walk or drive around the block and immediate area and to any places the person may regularly visit. If possible, have somebody stay at home in case the person comes home and so that the telephone can be answered. Contact your local police. Tell them the person has dementia and of any concerns you have for their safety. The police will require details and a description of the person and of the clothes being worn. It is always useful to have a recent colour photo. The police may also ask about familiar or favourite places for the person. Do not scold or show anxiety no matter how worried or inconvenienced you have been. They may have been confused and frightened themselves. Provide reassurance and get back into a regular routine as quickly as possible.